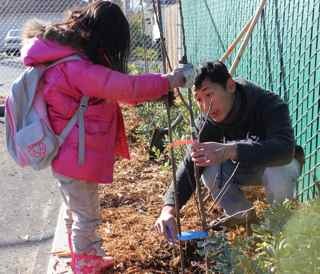 About 90 volunteers descended on two schools in East Palo Alto today to plant a variety of fruit trees as a way to commemorate the Martin Luther King Jr. Day of Service. The nonprofit group Collective Roots organized the event at the East Palo Alto Phoenix Acadamy and the East Palo Alto Charter School. Volunteers came from all over the valley. There were high school groups, families with small children, Americorps volunteers, and residents from the neighborhood. 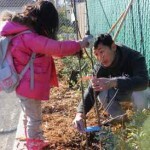 Together they planted about 40 citrus and avocado trees around the playgrounds and parking areas of the Phoenix Acadamy, and another 25 on the grounds of the charter school, where Collective Roots operates an educational garden.